If you want to minimize the amount of electricity used by your computer but dislike shutting down your computer because of the amount of time it need to start it up and open your applications, there is a compromise to be had if your operating system is configured properly to hibernate. Hibernating an operating system means that all the information in the system memory (RAM to be precise) is written down as a “snapshot image” to the hard disk. The PC hardware is then turned off since the hard disk will not lose its information when powered down. When the machine is turned back on, the booting process of the operating system will look for a store snapshot image and load it back into the system memory. If this is successful, you will have your desktop at the same state as when it was hibernated. The time it needs to resume a hibernated image is relatively small compared to when booting the operating system from scratch (or what is called a cold boot). Go to Start->Control Panel->Power Options. Go to the “Hibernate” tab and ensure that the “Enable hibernation” check box is ticked. Click OK to dismiss the dialog and apply the change. WARNING: This will reserve space on the system drive equal to the amount of RAM in your computer. If you have 2GB of RAM, 2GB of hard disk space will be set aside for hibernation. 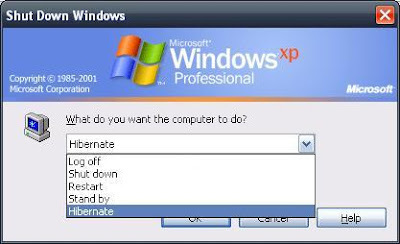 To hibernate, shutdown the machine but select the hibernate option. The machine will be turned off automatically (if this is properly configured). To resume the hibernated image, turn on the machine. The image will be invalidated after a successful resume. – Some applications, usually those that have time-bound login sessions, do not like being hibernated. – The space set aside for the hibernation support is different with the space allocated for the virtual memory. – If the machine fails to resume or hangs while in the process of resuming, reboot the machine and boot into safe mode (Press F8 after the BIOS screens). Reboot the machine to invalidate the hibernate images and the machine should boot normally after. Zip integration was introduced starting Windows XP which enables the Windows Explorer to treat zip archives as a normal directory. This allows users to visit the content structure of the archive without depending on an external application like Winzip or extracting the content. The downside of this integration is that Windows Explorer needs to finish reading all of the zip archives in the directory being visited before the directory contents are listed. This can cause a significant performance slowdown if there are many or huge zip files in the directory. The command above will clear all zip file associations. If you have Winzip installed, launch a new instance and Winzip will prompt if you want to restore the association. Select the ‘Yes‘ option otherwise zip archives will not be handled properly when double-clicked from Windows Explorer. If another archiver utility is used, look around the preference page for the association options if the prompt doesnt show at the startup of the the utility. If Winzip was configured to not show the prompt above, the associations can be done from the Tools->Configuration->System menu. If you are using a different application for handling archives (e.g. WinRar, 7zip, etc. ), explore it’s configuration window or refer to the manual. 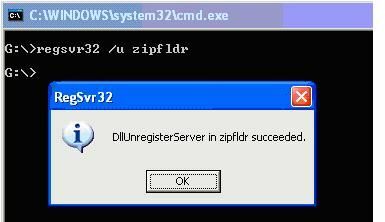 The command “regsvr32 zipfldr” will restore the zip integration of Windows Explorer. BONUS: Dump Winzip and switch to 7zip. It supports more archive types, achieves significantly better compression, and best of all it is Open Source and free! Windows Explorer suddenly died and you are left with a bunch of application windows open. Before you perform a hard reboot by flicking off the switch, here are a few tips to enable the system to cleanly recover or reboot. These are all assuming that the system is still responsive. Press “Alt+Tab” to cycle to an open command terminal. Execute the command “explorer” from there. Press “Ctrl+Alt+Delete” and press the “Task Manager” button to launch the task manager. Navigate to the Applications tab and use the “New Task…” button to execute the “explorer” command. If the mouse is also not responsive, you can use the “Tab” button to navigate the controls in the dialog windows. If the new Windows Explorer instance also refuses to function, a soft boot of the operating system would be in order. Since the “Start->Logoff” menu will also be inaccessible, try using the shutdown command to restart the machine. Press “Alt+Tab” to cycle to an open command terminal. Execute the command “shutdown -r” from there. 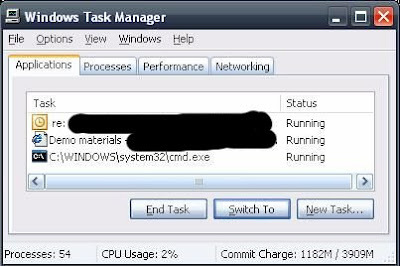 Press “Ctrl+Alt+Delete” and press the “Task Manager” button to launch the task manager. Navigate to the Applications tab and use the “New Task…” button to execute the “shutdown -r” command. The shutdown command also has a graphical interface if you prefer to use a Window to shutdown a window. Invoke the command “shutdown –i” to launch the GUI. A hard boot is the only remaining option. Try pressing and holding the power-off button for a few seconds to invoke the motherboard’s power-down feature. If this still doesn’t work then go for the last resort of pulling the plug. If you need to free storage space in your C:\ drive, here are the following files that are *relatively* safe to remove. See notes and disclaimer below. Log files placed in log directories. Consult the application manual or your friendly neighborhood techie if you are in doubt. Files with the “BAK” or “BACK” extensions. These are usually temporary files created by applications performing actions that physically alter the files. Evaluate if you still need the backup prior to removal. Files with names starting with the tilde (~) symbol. These are temporarily files created by some applications (notably MS Office) that it failed to remove after the file was closed. [May require elevated privileges] Contents of the “%SYSTEMROOT%\Temp” directory. Delete as much of the files you can but there will be some file not available for removal as they are currently in use. Contents of the “%USERPROFILE%\Local Settings\Temp” directory. Delete as much of the files as you can but there will be some not available for removal as they are currently in use. [May require elevated privileges] Directories in “%SYSTEMROOT%” that follows the format “[identifier]$”. These are information required to uninstall Official Windows patches. DO NOT REMOVE directories that do not follow the format above. As this tip deals with deleting of files, the information is intended for educational purposes only. Please think twice about permanently removing files (shift+delete, removing from the recycle bin). Use the information above at your own risk. To know where your %SYSTEMROOT% and %USERPROFILE% directories are, execute the command echo “%SYSTEMROOT%” and echo “%USERPROFILE%” in a command window. When removing uninstall information for Windows patches, consider leaving behind folders with “Date Modified” values of at most one month prior to the current date. The probability of uninstalling patches installed at older dates becomes small if the machine is in constant use. Some files may require elevated privileges that are not granted to normal users. If this is the case and you need to free up space, seek assistance from your workstation administrator.